Gamescom 2018 is currently underway and even though the biggest announcement came from NVIDIA in the form of new RTX graphics cards, Microsoft had some interesting information planned for the gaming event. Here is a look at everything Microsoft announced for the Xbox One which includes new console bundles, game trailer reveals and new features that are available for Xbox Design Labs. If you are one looking to pick up an Xbox One S or the Xbox One X, there are a lot of console bundles that have been announced. Which of these bundles will make their way to India is yet to be seen. First up, there is the Battlefield 5 bundle. The One S bundle comes with the game, a wireless controller and 14-day Xbox Live Gold. 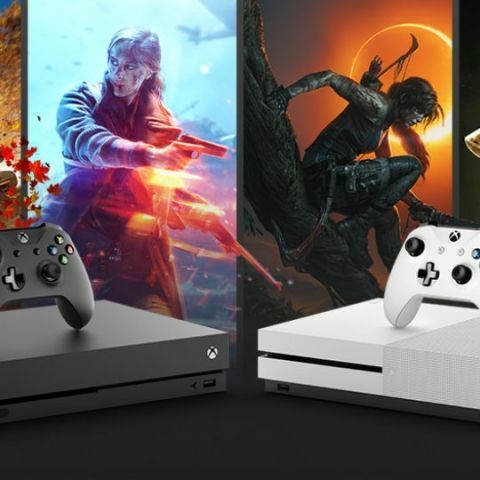 The Xbox One X bundle includes a copy of Battlefield V, a standard wireless controller, one-month pass of EA Access and a 14-day trial for Xbox Live Gold. There is also a Battlefield V Gold Rush special edition Xbox One X. The console comes in a gray-and-gold colour scheme, along with a matching gray controller. The bundle will include Battlefield V Deluxe Edition, along with a download code for Battlefield 1943. You will also get one month of EA Access, one month of Xbox Game Pass and 14-day Xbox Live Gold trial. Next up, we have a Fallout 76 Xbox One X bundle. It is the same standard Xbox One X console and controller in the box and includes a digital download of Fallout 76. You also get one month of Xbox Game Pass and one month of Xbox Live Gold. Forza Horizon 4 also gets a bundle. The Xbox One S bundle with Forza Horizon 4 comes with one month of Game Pass and a 14-day Xbox Live Gold trial. The One X bundle gets Forza Motorsport 7 as well. The consoles are the standard variant in each case. Shadow of the Tomb Raider also gets a console bundle. Both, the Xbox One X and an Xbox One S Shadow of the Tomb Raider bundle, come with 1TB storage. You also get 14-day trial for Xbox Live and one month of Xbox Game Pass. Apart from the console bundles, there are also some cool controllers that you can get your hands on. There is a PUBG controller that was announced along with the fact that the game is finally exiting Xbox Game preview and will be available at retail. You can check out those details here. Other controller announcements revolved around new features coming to Xbox Design Lab Controllers. For those that aren’t aware, Xbox Design lab lets you customize the controller and make it personal. Microsoft has added five new camouflage options and five new shadow options. The new additions include a Desert Camo paint job and a blue shadow colour scheme that fades to black. There is also a limited-time silver shadow controller. This will be available until Sept. 30. Xbox Design Lab is not available in India. Apart from the new controller aesthetics and console bundles, there were a lot of game trailers that made their way to the Xbox Gamescom presentation. Halo Infinite and Gears of War were not a part of the presentation. However, we did get some interesting information on some highly anticipated games. After Devil May Cry 4, we got DmC which was met with mixed reception. Capcom has been hard at working bring a true sequel to DMC 4. DMC 5 has an new trailer at Gamescom showing off some interesting battles along with a grand revel for Dante! Devil May Cry 5 will release on March 8, 2019. Hunt: Showdown is a first person multiplayer shooter where monsters have overrun the world and it is your job to destroy them for a bounty. The game has interesting survival mechanics where the hunter becomes the hunted after he has taken down the monster and is on his way to collect the bounty. The game is coming to Xbox Game Preview. Battlefield V is launching on October 19 and at Gamescom 2018, the game got a new trailer which focuses on "Companies" and combat customization. State of Decay 2 is all set to get a "Daybreak Pack". The pack will be available for the game on September 12. You don the role of a powerful "Red Talon" soldier. The scenario is a lot like "Horde Mode" from Gears of War. The objective is to defend a location from aggressive zombies. Sea of Thieves is getting an expansion called the Forsaken Shores. The expansion is coming to Xbox One and Windows 10 on September 19. The expansion brings with it a new dangerous location for you to explore and conquer. A new mode has been announced for Ori and the Will of the Wisps. Called Spirit Trial mode, players will find Spirit Trials hidden throughout the game. As the name suggests, you will be able to face a time trial where you can compare your scores with that of friends. You will be racing against your friends’ ghosts to see who used the best tactics to get the fastest time. Metro Exodus is one of the most anticipated game for PCs and consoles. The new trailer highlights the diversity in environments that players can expect to see. If you like gripping stories and horror in video games, then the Dark Picture Anthology is the one for you. From the masterminds behind Until Dawn comes Man of Medan. You can check out the trailer below. The developer has said that the Dark Picture Anthology is a collection of horror games. Two of which will release every year. Does RAM clock speed have an impact on gaming? Devil May Cry 5 review: Fast-paced over the top action!